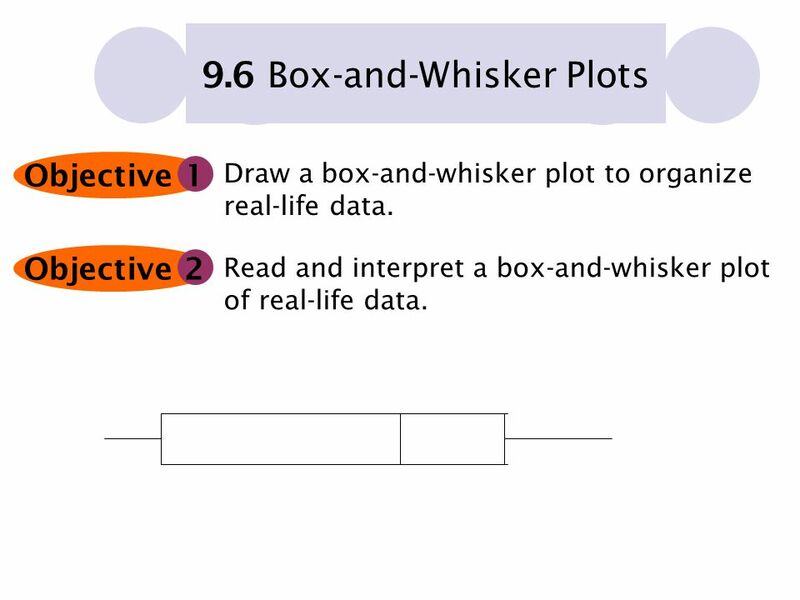 Objective 1 9.6 Box-and-Whisker Plots Draw a box-and-whisker plot to organize real-life data. 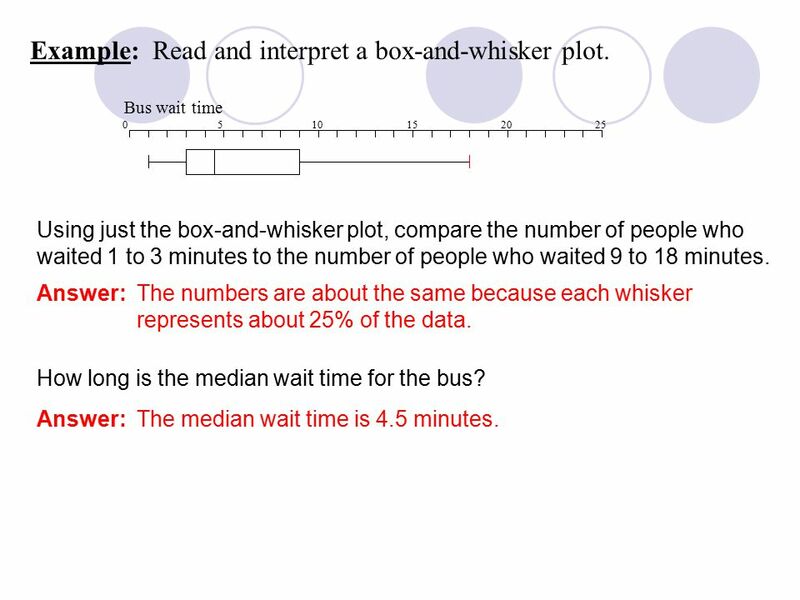 Read and interpret a box-and-whisker plot of real-life data. 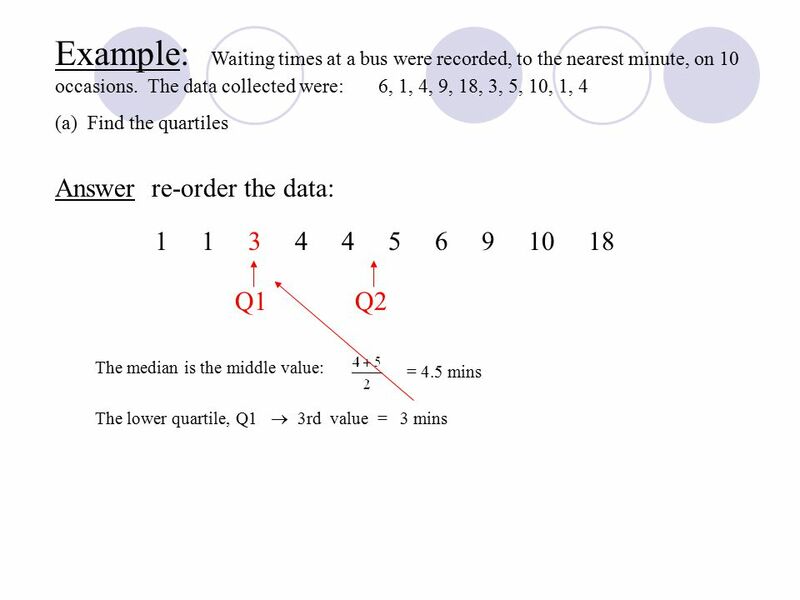 2 The median or second quartile separates the set into two halves, the numbers that are below the median and the numbers that are above the median. 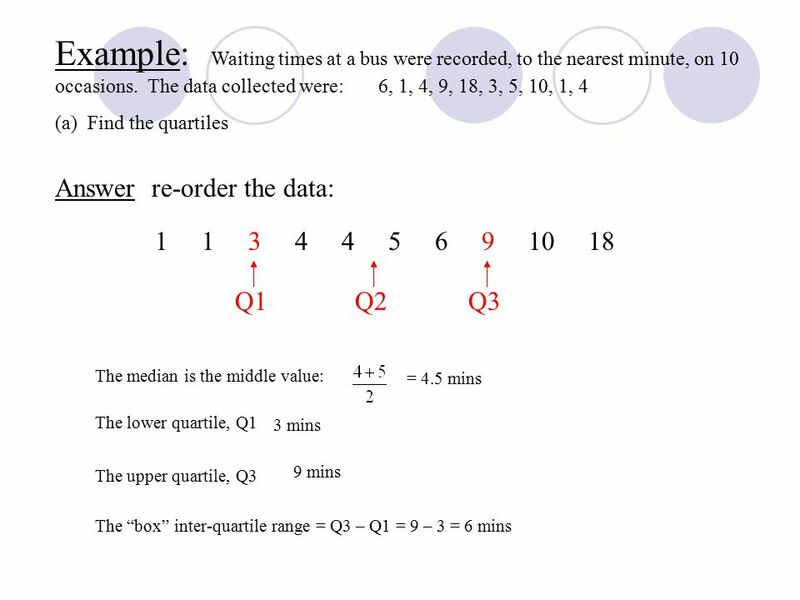 The first quartile is the median of the lower half. The third quartile is the median of the upper half. The “box” extends from the first to the third quartile. 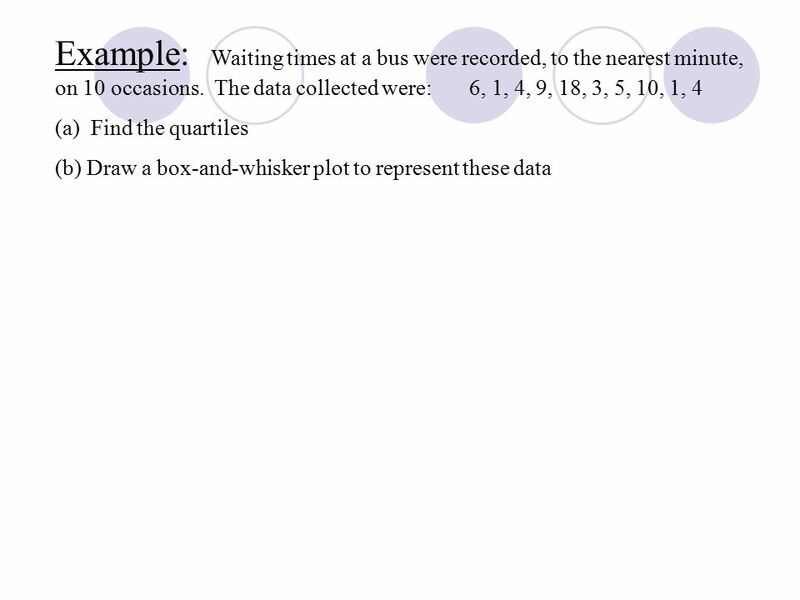 The “whiskers” connect the box to the least and greatest numbers. 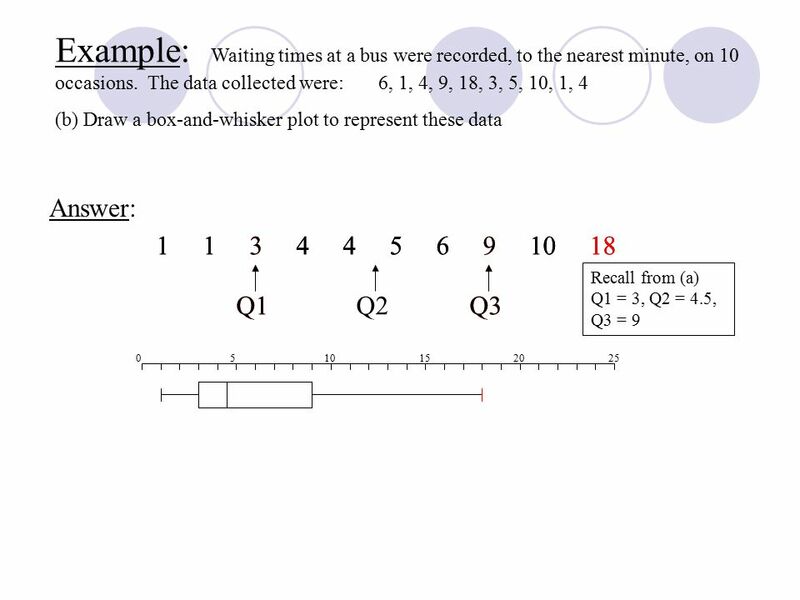 A box-and-whisker plot is a data display that divides a set of data into four parts. Download ppt "Objective 1 9.6 Box-and-Whisker Plots Draw a box-and-whisker plot to organize real-life data. Read and interpret a box-and-whisker plot of real-life data." Box-and-Whisker Plots SOL Step 1 – Order Numbers 1. Order the set of numbers from least to greatest. 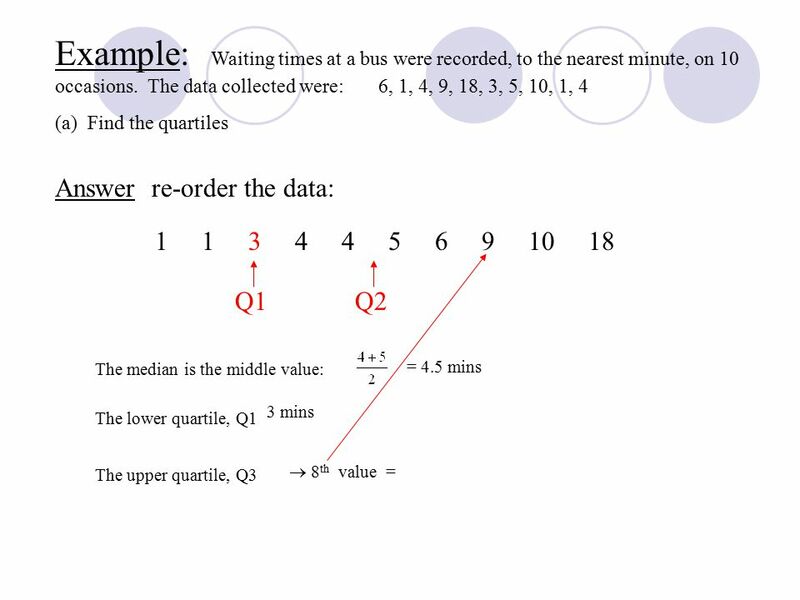 Learn to find measures of variability. Box-and-whisker Plots. SDAP1.1 Know various forms of display for data sets, including a stem-and-leaf plot or box-and-whisker plot; use the forms to display a single set of data. Holt CA Course Box-and-Whisker Plots Warm Up 1. 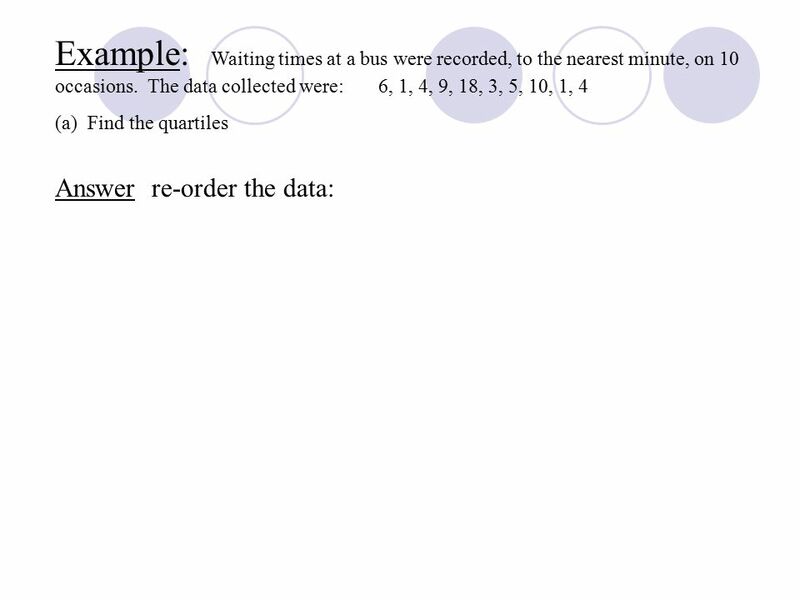 Order the test scores from least to greatest: 89, 93, 79, 87, 91, 88, Find the median of the. 11.2B Box- and Whisker Plots Statistics Mrs. Spitz Fall 2008. Cumulative Frequency and Box Plots. 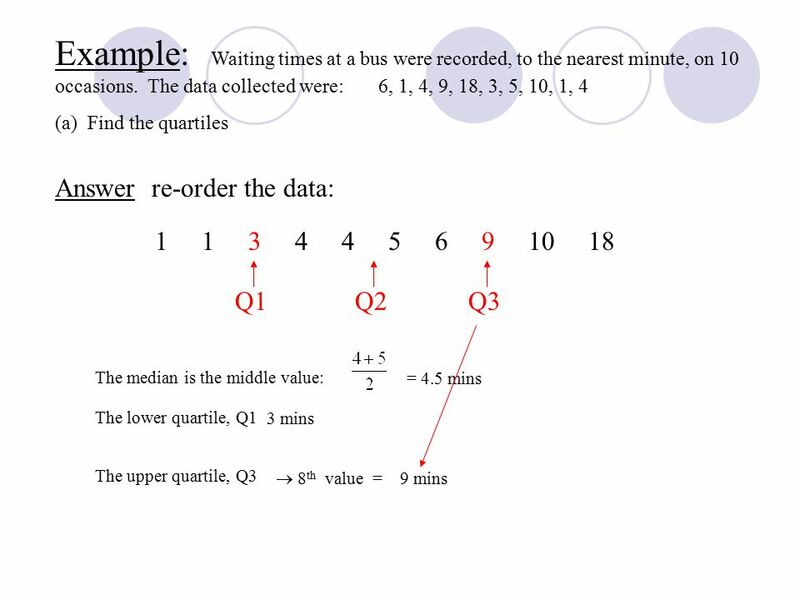 Learning Objectives  To be able to draw a cumulative frequency curve and use it to estimate the median and interquartile. Starter 1.Find the median of Find the median of Calculate the range of Calculate the mode. 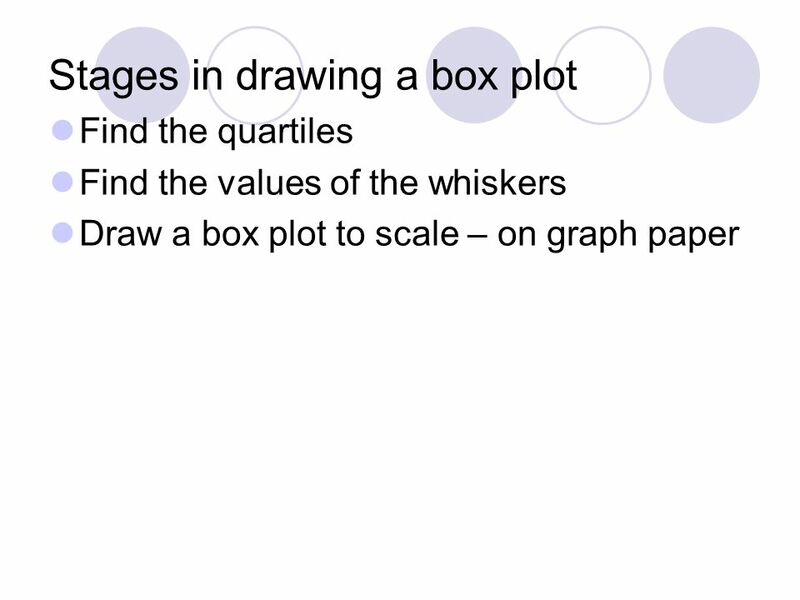 Box and Whisker Plots and the 5 number summary Chapter 6 Section 7 Ms. Mayer Algebra 1. BOX PLOTS/QUARTILES. 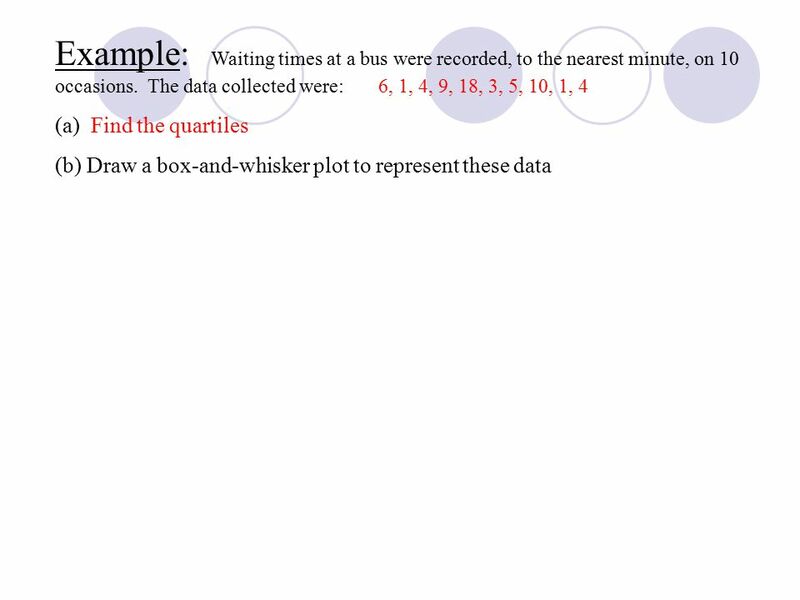 QUARTILES: 3 points in a set of data that separate the set into 4 equal parts. Lower Quartile: Q1 (The median for the lower half. 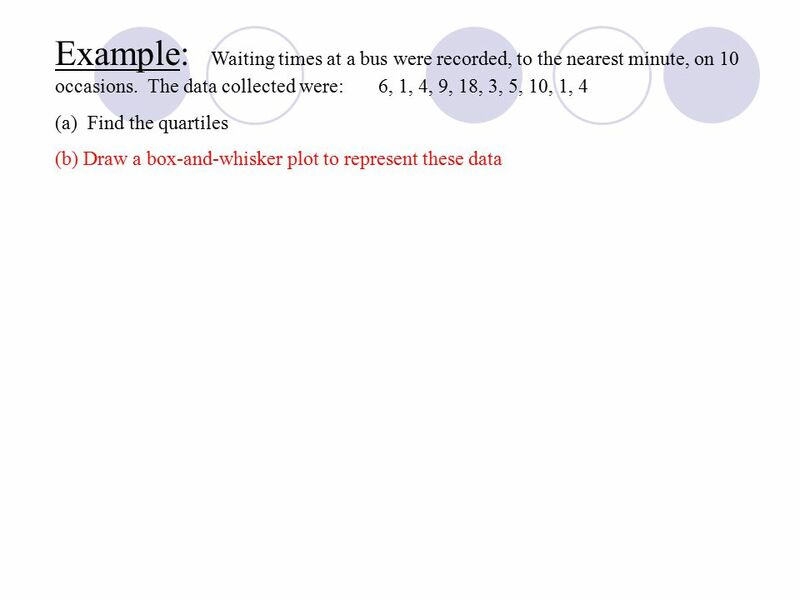 Box and Whisker Plot 5 Number Summary for Odd Numbered Data Sets. 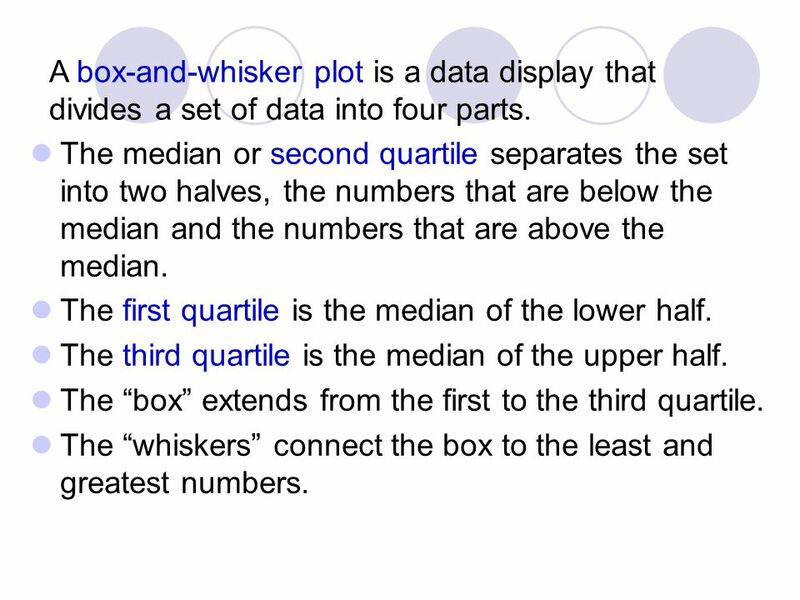 Box and Whisker Plots A diagram that summarizes data by dividing it into four parts. It compares two sets of data. BOX AND WHISKER PLOT Nicole Castro Sebastian Rivera Alyssa Frye George Moerler. EXAMPLE 1 Make a box-and-whisker plot SONG LENGTHS The lengths of songs (in seconds) on a CD are listed below. Make a box-and-whisker plot of the song. Sample Box-and-Whisker Plot lower extreme, or minimum value 1st quartile, the median of the lower half of the data set 2nd quartile, the median of the.